Rate this Article Being one of the world's biggest TV shows of all time, it is inevitable that Game of Thrones will be adapted for a slot game as well. How does the game fare though? Well, let's take a look! Game of Thrones is one of the world’s most popular TV shows right now and it is literally impossible to not know about it, especially if you happen to have access to either HBO or to the internet. The show features the storyline from George R.R. Martin’s heptalogy (of the same name) where political intrigue, backstabbing and conflict are rampant between the seven powerful Houses as they fight for the right to claim the Iron Throne and become the ruler of the Seven Kingdoms. The hype and the following for Game of Thrones is just incredible and, mainly due to this, it is not at all surprising for Microgaming, one of the largest online slot games developers, to adapt the iconic fantasy medieval series into an entertaining slots game for fans of either the TV show or uniquely-different slot game, or both. Let’s take a look! This game is a 5x3 slot (5-reel, 3-row) that offers 15 paylines. Interestingly, the paylines used are not the standard sort. Instead, it is more similar to a standard 243 payline where you can get a win simply by matching at least 3 symbols anywhere on adjacent reels from left to right. The game is available on your mobile devices as well. The main thing that attracts people to Game of Thrones is its gripping immersion that will just pull you right into the fictional world and keep you engaged with plenty of events, be it another one of Cersei’s cunning plans or Jon Snow’s heroic missions beyond The Wall. Thankfully, this Game of Thrones-themed online slots have immersion by the bucket loads. Even from the get-go, you will get to enjoy audio and visuals that will remind you of your favorite TV show, including the familiar and iconic soundtrack that starts every Game of Thrones show as well as short cinematic clips of various important moments in the series. Game of Thrones slots have three main game features that truly makes it unique, they include random cash prizes, House-based Free Spins and Gamble Trail. To trigger the first bonus, you merely need to get 2 of the Iron Throne Scatter symbols anywhere on the reels. The Free Spins bonus, on the other hand, is only activated whenever you receive three or more of the Scatter symbols regardless of which position they are in. Once active, you will be presented with the four major houses in the Game of Thrones story, namely House Baratheon, House Lannister, House Stark and House Targaryen. Each of these houses offer a different number of Free Spins in exchange for multipliers and symbol stacks. 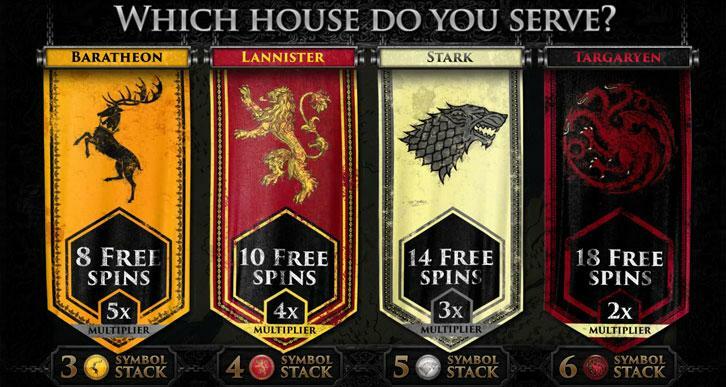 For instance, if you choose House Baratheon, you will only get 8 free spins. However, you can get the highest multiplier and the lowest symbol stack. If you opt for the House Targaryen though, you will get the exact opposite – a lot more Free Spins but the lowest multipliers and the highest symbol stack. Free Spins can be retriggered as well. The Gamble Trail feature is only triggered whenever you got a win, providing players with the chance to further gamble their winnings by calling Heads or Tails on a simple Coin Flip. However, prior to doing so, you can choose four iconic creatures in Game of Thrones, which includes the 3-Eyed Raven, White Walker, Direwolf and Dragon. The creature you choose doesn’t really affect your odds but it does change the little cinematic that you get to see if your coin flip is successful. For those looking to try their hand at the Game of Throne slots by Microgaming, online casino Betway offers an attractive welcome bonus. Those who don’t already have an account with the iGaming brand, can get a welcome bonus of up to £1000. There are several conditions you will have to fulfil, of course, such as opting in for the bonus in the first place, but generally, you should be able to easily get your bonus. There are also additional bonuses that await you when you make your second or third deposits. 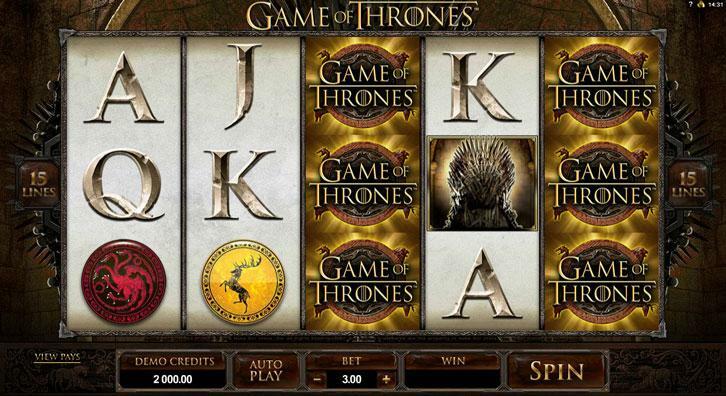 With the conclusion of Season 7 of Game of Thrones, many people are looking to fill in that empty Game of Thrones void in their lives and honestly, this slot game might just do the trick. The game has many fun and appealing features that will keep you coming back for more.